The Raven: Spirit of Transformation is one of the newest statues in Stanley Park, but also one of the least known. It is located in the Miniature Train area in the middle of the pool of water in front of the stage. This statue was carved by artist Richard Krentz out of a Douglas Fir stump that was a casualty of the 2006 Windstorm that caused severe damage to Stanley Park. This is a beautiful statue from all angles! There is no plaque associated with the statue and most people don't realize the Raven is a significant statue. Over the years, it has gathered spider webs and has aged with the weather. 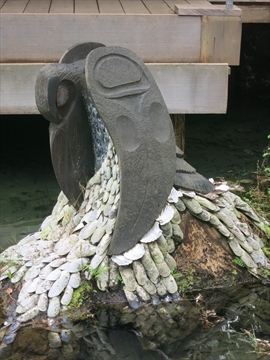 Where is the Raven: Spirit of Transformation Statue in Stanley Park? 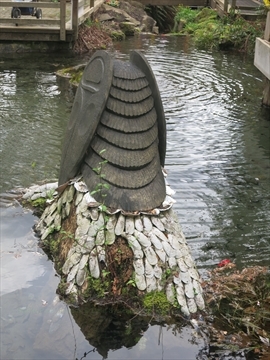 The Raven: Spirit of Transformation Statue in Stanley Park is located next to the pond across the plaza from the ticket booth in the Stanley Park Junction where the Miniature Train operates from. The statue used to be in the middle of the pond, but in early 2017 it was moved onto land when the stage was demolished. Nearby is the Bus Loop and the Air Force Garden of Remembrance, and Stanley Park Pavilion.